Caramel corn made the way it should be! Real, wholesome ingredients assembled in a copper kettle the old fashioned way. Approx. 10oz. 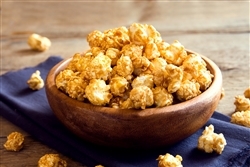 Caramel corn made the way it should be! Real, wholesome ingredients assembled in a copper kettle the old fashioned way. 10oz.